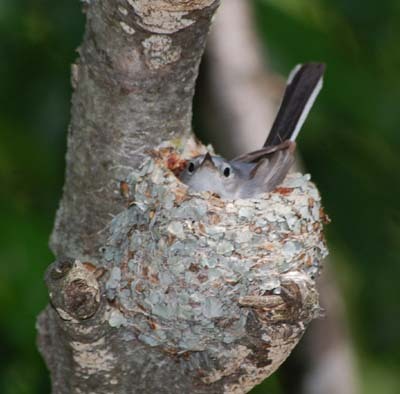 Blue-gray gnatcatchers are known for recycling their old nest to build a new one for their second nest. 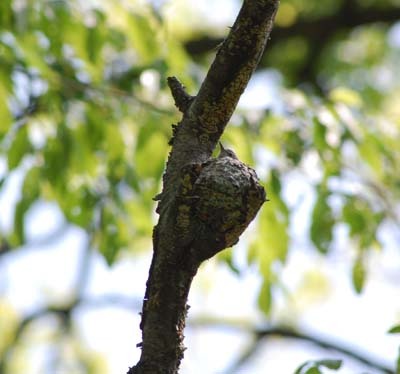 This spring, the gnatcatchers built three consecutive nests, totally dismantling the first and second to build the second and third. 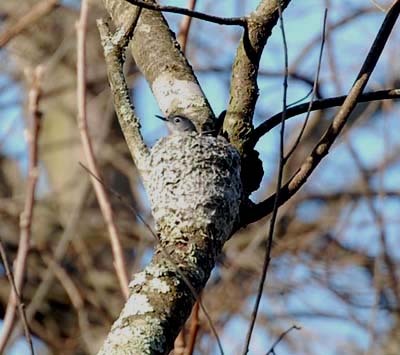 When the second nest appeared to be completed, on May 1st, I observed a female cowbird perched several feet above the nest, appearing to watch the nest with great interest for several minutes. 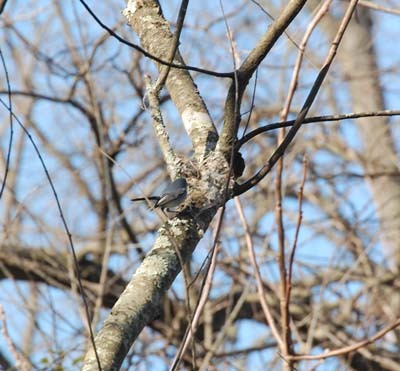 Still higher in the same tree, the gnatcatcher pair were flitting back and forth above the catbird. 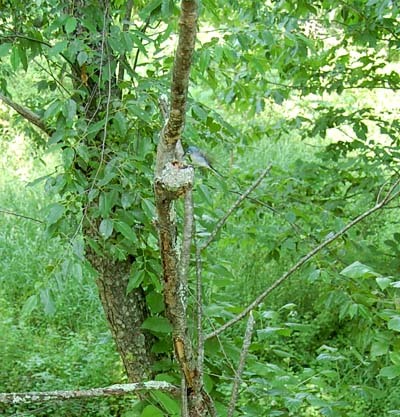 On May 12, the gnatcatchers were dismantling this second nest and carrying the material back across the creek in the direction of the first nest. 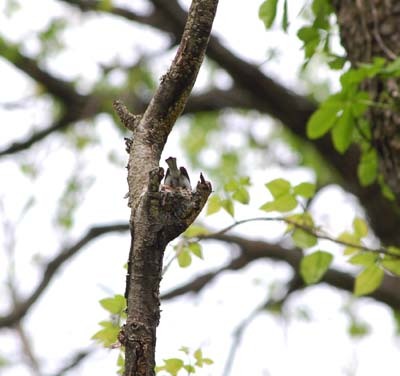 On May 15, the third nest was discovered, not back across the creek, but only 50 feet from the second nest and 25 feet high on a slender dead vertical snag. 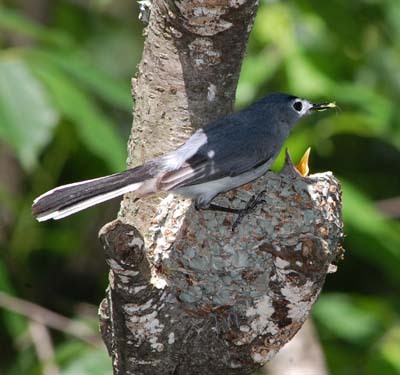 The reason for building and then recycling two nests before finally nesting in the third is unclear. 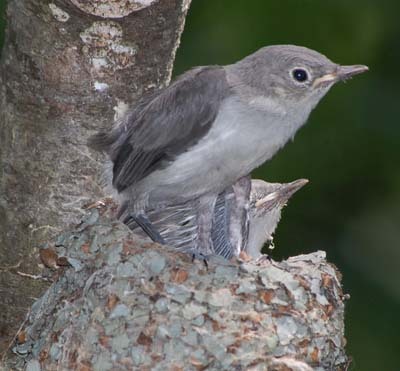 Could this have been the gnatcatchers' response to brood parasitism by the cowbird? 4/24 The first nest appears completed. 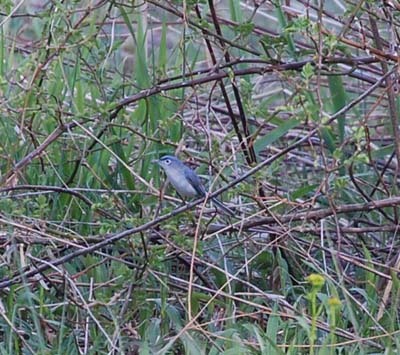 4/26 The male gnatcatcher in brambles near the ground. 4/27 The male removing material from the just completed first nest. 4/27 Continuing deconstruction of the first nest. 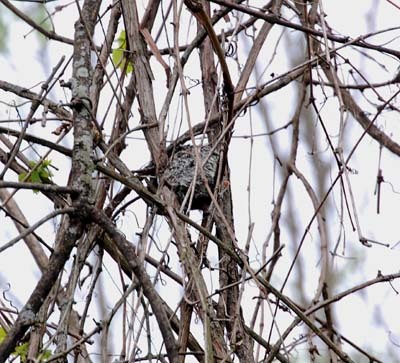 4/27 Building the second nest in a tangle of dead vines - an atypical location for the gnatcatchers. 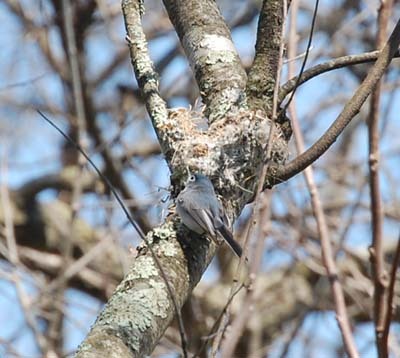 5/12 The second nest just before the gnatcatchers began to also recycle this one to build a third nest. 5/15 Building the third nest, this time in a dead vertical branch 25' above ground. 5/19 Lining the third nest. 5/22 The female appears to be incubating. 6/2 Finally the scaffold blind is in place for closeup viewing. The blind in place. 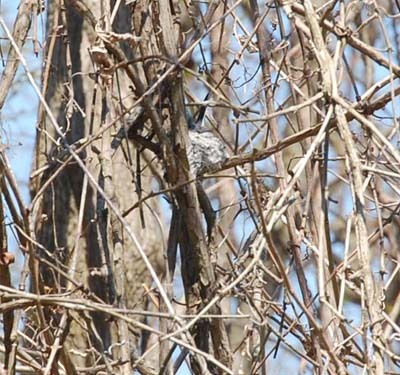 The nest is in the small vertical branch on the left of the blind, 25 ft up. A mirror check showed 3 gnatcatcher eggs and no cowbird egg.. The remote video equipment housed in a chart recorder case and the jeep battery in a dairy box. 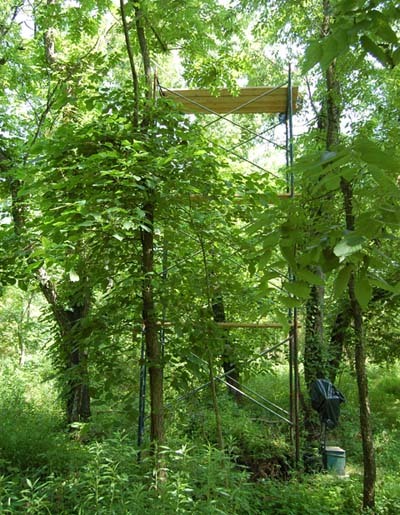 By now, the foliage was too dense to use the solar panel. 6/9 A wider shot of the nest. 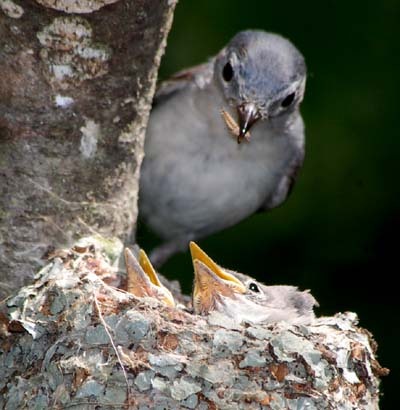 The gnatcatchers are now feeding young. The edge of the blind is about 15' from the nest. 6/9 The videocamera mounted closer to the nest. 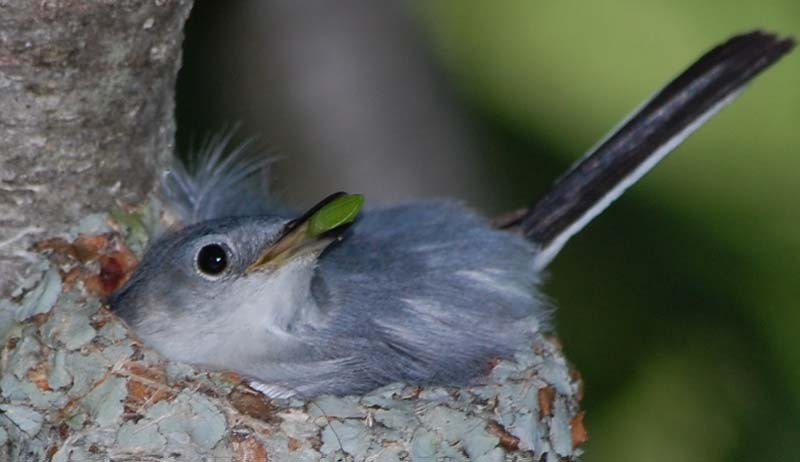 Blue-gray gnatcatchers show no concern when they encounter a human up in the canopy. 6/7 The female incubating 3 eggs after accepting a treat from the male. 6/15 The young are more mature than they seem. They stay low in the nest cup, even when food is brought. 6/15 A great variety of insects and spiders are brought to the nest. 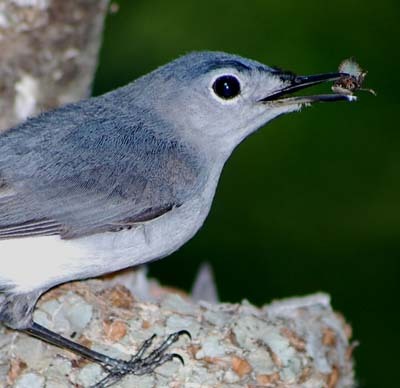 The gnatcatcher prey consists of fewer examples of larger insects than that observed at the house wren gourds. 6/16 Feeding as usual. I had no idea this would be fledge day. 6/16 This is the highest one of the nestlings had ever stretched to receive food. 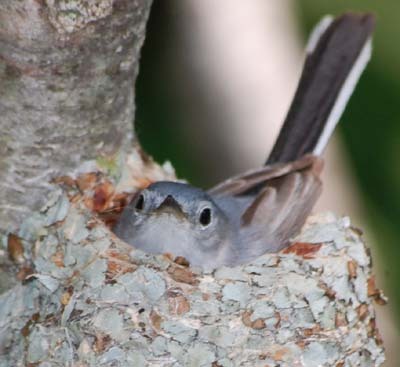 The blue-gray gnatcatchers' repeated nest moves were a surprise. 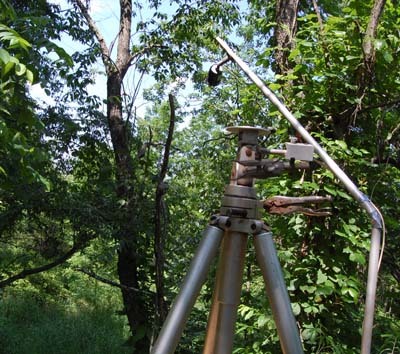 That, coupled with frequent high water at the creek crossing and other delays in erecting the scaffolding and setting up the remote video resulted in only one day of continuous video. But, luckily, there was nothing dramatic to record anyway. 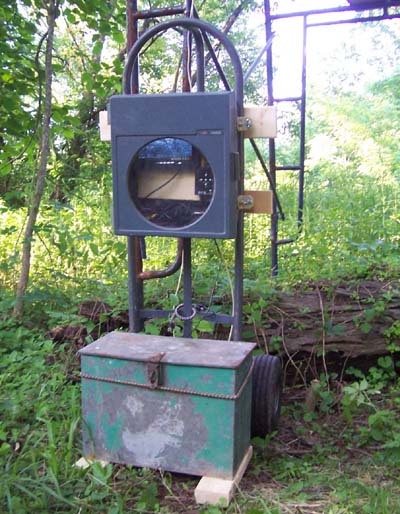 The very open location of the nest suggested that nest predation might be likely. The nest was clearly visible from above. 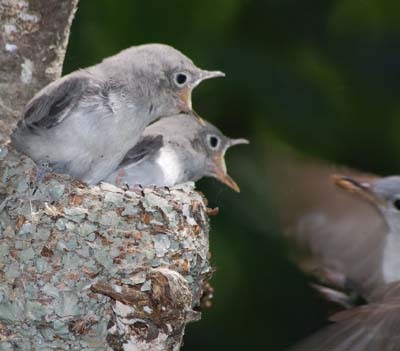 And, the gnatcatchers are extremely active birds, continually flitting about in the treetops. 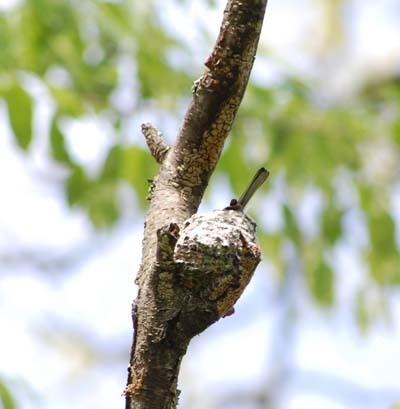 However, the lichen covered nests are well camoflaged and the nestlings tend to stay low in the nest cup compared to most other species. 6/16 Moments before the first fledge. Only then was it apparent that the third nestling was present. The two remaining fledged the next day.